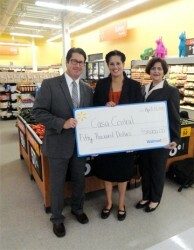 John Bisio, Chicago director of public affairs and government relations for Walmart, presented a $50,000.00 check before Rebecca Gonzalez, vice president of Programs and Operations and Patricia Vazquez, external relations major gifts officer at Casa Central. This took place at the grand opening of a new Supercenter in the Belmont Cragin neighborhood located at 4626 W. Diversey Ave. This generous donation from Walmart developed as a response to the unmet nutritional needs of children ages 2-18. The Healthy Children Initiative exposes participants to an in-depth nutrition and education curriculum that focuses on four key goals: (1) incorporating the major food groups in daily eating, (2) portion control, (3) daily physical activity, and (4) focusing on the importance of taking small steps for success. Support from the Walmart Foundation allows Casa Central to expand this initiative to include our early learning programs, and our Youth Opportunities Unlimited Program for teens, thus reaching over 400 children, youth, and families.